Read this ages ago. This is a duplicate copy, which can go out immediately. Enjoyed reading this one. Was a little hard to suspend my disbelief at times. I did appreciate her message of empowerment for women. Released on Tuesday, March 11, 2003 at Borders Books North/183 in Austin, Texas USA. WONDERFUL book I hope someone else will enjoy it as much as me. It reminds of Mutant Message Down Under, a great book as well, except it isn't entirely fact. Release planned for Thursday, April 17, 2003 at QUACKS 43rd and Duval in Austin, Texas USA. This is a great book. Autobiographical spiritual awakening. I can't wait to read more L. Andrews books. Marinaw do you have any more??? Did not get picked up at Quack's, so I took it back home for trading purposes. This one's avilable now. Released on Tuesday, August 12, 2003 at BookPeople, 5th and Lamar, behind Whole Foods in Austin, Texas USA. Hoping to release this (again) at the MeetUp tonight. I picked up this book at the AustinBookCrossers Meetup at Book People last night. I look forward to reading it! Wow! What a great book! I had trouble putting it down... very engaging story. 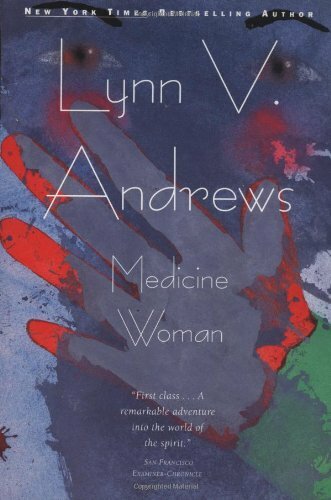 I liked getting a glimpse of what it was/is like to be a medicine woman's apprentice. It gave me a lot to think about by presenting this philosophy and religion from a very personal vantage point instead of an academic angle. Released on Wednesday, October 15, 2003 at Austin Bookcrossers box o' books to Russia in Austin, Texas USA. Many, many thanks to fellow BookCrossers from Austin for the book!! I'm really grateful for your M-bag! It's really hard to believe the story is true at times. But it kept me fascinated & thrilled anyway. Like a real thriller.. The book's going to continue its travel soon :) ! sending it to biba89. Happy reading! The Medicine woman has arrived safely in Holland. I will start reading it tomorrow. Thank you for the lovely drawing and letter that accompanied it! I still don't know what to make of this book, and of this Lynn Andrews person. I will have to search the internet to find out more. At first, I refused to believe she could be authentic, let alone her experiences. I just could not imagine all of this happening to a white person, without this person ever questioning her own senses. And then, as these things go, I happened to meet an old acquaintance on the train, who happens to be experienced in carrying out traditional Indian sweat lodge ceremonies. Carried out by white people, for white people, in Holland. I discussed this book with him and I vented my doubts. His comment was that yes, we -white people- tend to analyze all our experiences to the bone, remaining aloof, inside our heads. But there is no reason we could not just as well reconnect to the forces of nature, to the elements, to life. A wise lesson, which I will take to heart, and which has changed my perception of this story at least somewhat.